After several dozens of races completed in the last years, including 11 marathons and an ultra, on February 22, a race hunted me down. 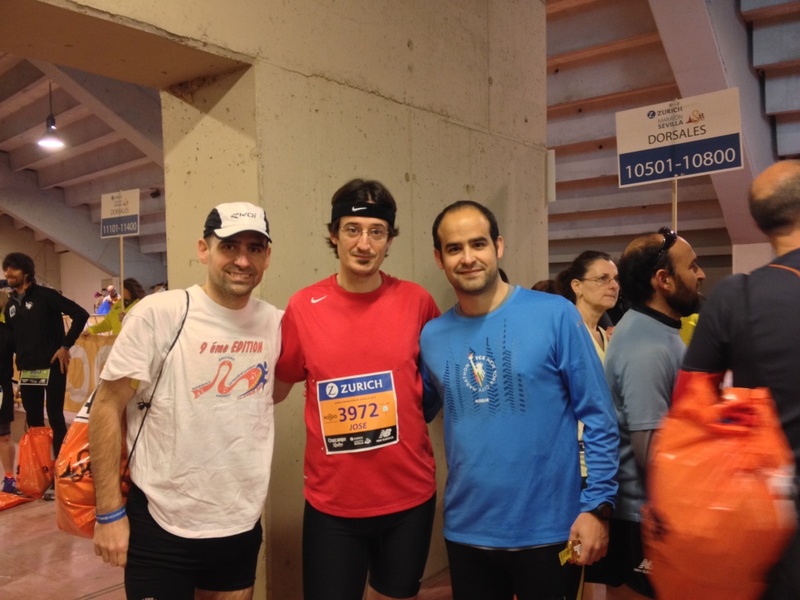 In the last Seville marathon I DNF. I did not finish. I wrote a post which was published on the morning of the race. In it I explained that I arrived to that marathon in my best shape so far. However, for me the race took place not on the Sunday 22nd February but on Saturday 21st. 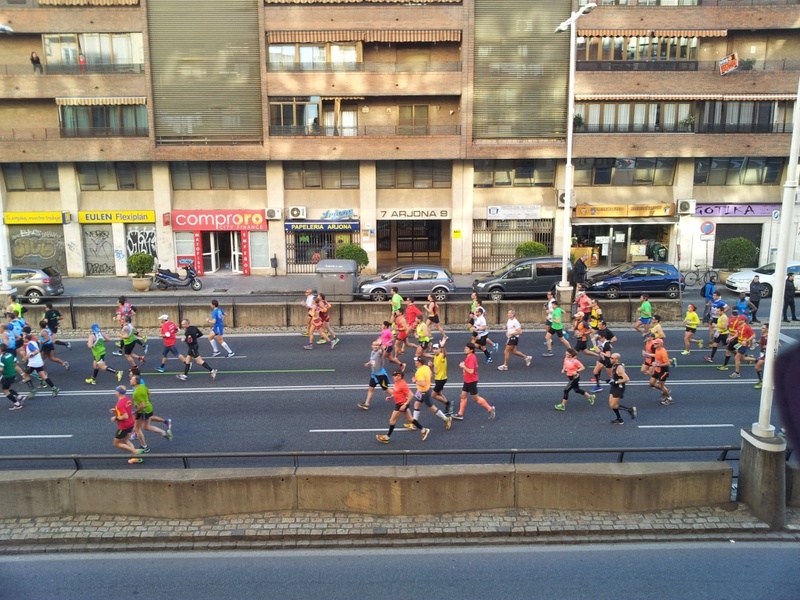 On Friday afternoon we went to the marathon expo at the FIBES. There we retrieved our running bibs, got the confirmation that we could start the race together, took our official expo picture and by chance I met elite runner Pablo Villalobos (1), with whom I had exchanged some tweets in the morning. The 4 of us posing with the running bib in front of the circuit map. With elite runner Pablo Villalobos. That evening we had dinner out with friends in the downtown; plenty of different delicious tapas to share. We had some fun… though at the end of the dinner I started feeling weak, and I went back to the hotel instead of staying with the friends to take some drinks. On Saturday morning I woke up with stomach problems and some diarrhea. I went to the pharmacy to get some pills and rested a few hours. I feared for the race the day after. 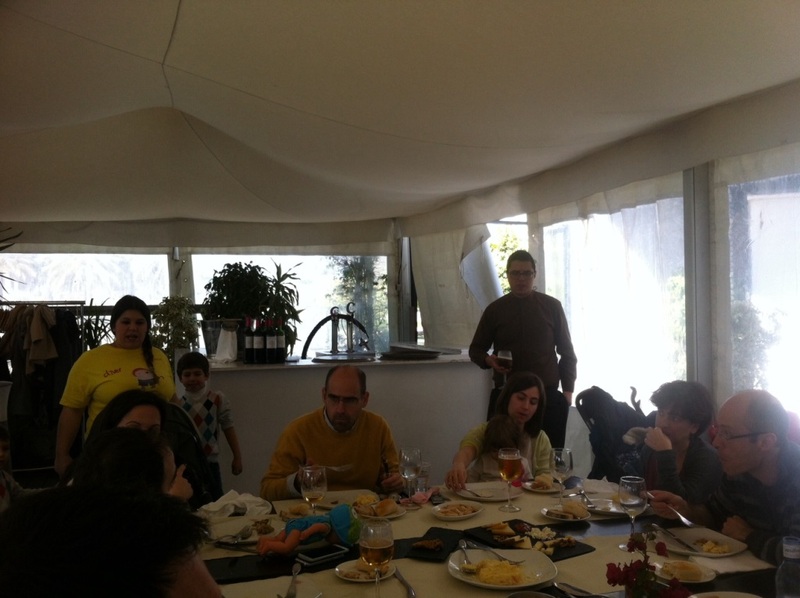 The hours passed and I felt a little bit better so we went to have lunch with some 14 friends at Puerto Delicia. After lunch we went for a walk and I started to feel weak again. We went back to the hotel room. By about 18h, in the bed, I started shivering. During the following hour the fever went up and up. At 19h I reached out for the WC to vomit (such a pity of the previous meals!). I called my brother to ask if he could bring me some drinks and food to the room. By 20h he came with some Aquarius and bananas. 10 hours to recover before waking up time, 13 hours to the marathon start time. That was the start of my race during the night in order to take part of the event. In the following hours I drank, ate and slept bit by bit, until 24h, when I finally put myself to get a long sleep (6 hours). On Sunday morning at 6am I woke up on the clock alarm. I stood up and it seemed that I felt OK. With that check I went downstairs to have breakfast. I met there Jaime and Juan, who were happy and very surprised to see me there. After the breakfast we took a taxi and departed for the Stadium at La Cartuja, where we met Jose. The day was sunny though a bit cold. Changing clothes, drinking a bit, seeing the thousands of runners going through the rituals before the race… that cheered me up. At few minutes before 9am we went to our corral, 3h45’-4h. We chatted with other runners and with that we went off for a good run! You can see here a good report of the marathon by my brother Jaime. We went together for the first 13 kilometres. Our target was to run at a pace of 5 minutes per km. We alternated some at a somewhat higher pace with other at a slower pace. At km 7 we saw Luca and Andrea who greeted us from the hotel room. Passing by the hotel at km 7. By the 10km mark we were just losing some 40″ in relation to our 3h30’ target time. After having drunk at a few supply posts I started feeling some pain in the stomach, like cramps. Something wasn’t working well. I told my brother and Jose to go ahead with their pace and forget about me. I wasn’t sure of the fate of my race. Ten minutes later, at km 15 I stopped at one of the WC cabins. I had to vomit everything I had taken. Not a good signal. I was emptying my reserves and not replenishing sugar nor minerals. I re-started at a slower pace (~5:15) for some minutes and then decreased it later (~5’20”-5’30”). I passed the half marathon point in 1h52’01”, not a bad time. In theory that would point at a marathon time of around 3h50′. However, the feelings weren’t good. At the km 22 I was feeling weaker and most important, I started to worry. After the last 24 hours, having vomited everything and not being able to ingest food and liquid, at some point I would run out of glucose. I feared that if I continued to run I would be risking fainting in any moment above around 2 hours. I pondered during some minutes whether to give it a try. “It doesn’t matter if you are well above 4 hours!” I had been there (in those times) before. I had completed other marathons in pain, injured. However, I thought this risk was more serious. At about km 23 I had decided to quit. I would have other marathons to beat my best time. Other marathons to complete. Other marathon to run with Jaime end to end. But it would not be this one. I continued running softly, seeking out for a taxi. I found it at km 26.6… and then I stepped aside. My Garmin data from Seville marathon. I regretted having quit not even a minute afterwards while seeing the runners along. I even saw Juan from the taxi… but thinking it over a few days later I think it was a good decision. In less than 2 months from that date and just 6 weeks from the date this post is published I will be running the Madrid marathon and there will hopefully be many other marathons to run. The experience in Seville will teach me to appreciate even more the marathons completed, to value the good health enjoyed on race days so far, and to realize how difficult is to achieve and beat a personal best time… something you do not conquer the day after you have been sick. Nevertheless, I love the distance, the race, the marathon, and I had to give it a try. I tried some thing epic but it could not be. (1) He had placed 2nd and 4th in previous editions of the race. You can check out his blog here. By the way, for Pablo it wasn’t also the best day: he quit in km 26 too, his first marathon not completed, too.